﻿ Acts 2:4 And they were all filled with the Holy Spirit and began to speak with other tongues, as the Spirit was giving them utterance. All of them were filled with the Holy Spirit and began to speak in foreign languages as the Spirit gave them that ability. 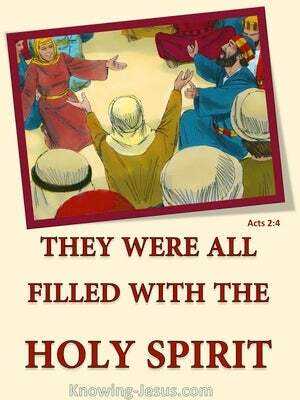 And they were all filled of Holy Spirit, and began to speak with other tongues, as the Spirit gave them to declare. 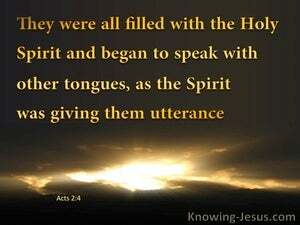 And they were all filled (diffused throughout their souls) with the Holy Spirit and began to speak in other (different, foreign) languages (tongues), as the Spirit kept giving them clear and loud expression [in each tongue in appropriate words]. And they were all full of the Holy Spirit, and were talking in different languages, as the Spirit gave them power. and they were all filled with the holy ghost, and began to speak in different languages, as the spirit gave them utterance. And they were all filled with the Holy Spirit, and began to speak with other tongues as the Spirit gave to them to speak forth. and they were all filled with the holy Spirit and began to say in foreign languages whatever the Spirit prompted them to utter. 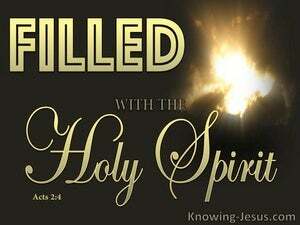 And they were all filled with the Holy Spirit, and began to speak in other tongues, as the Spirit gave them to utter. And they were all filled with the Holy Spirit and began to speak in other languages as the Spirit gave them [ability] to speak out. and they were all filled with the holy ghost, and began to speak with other tongues, even as the spirit gave them utterance. and they were all filled with the holy Spirit ? ?they began to speak in foreign tongues, as the Spirit enabled them to express themselves. All of them were filled with the Holy Spirit, and they began to speak in other languages as the Spirit enabled them. And they were all filled with the Holy Spirit, and began to speak with other tongues, even as the Spirit gave them utterance. 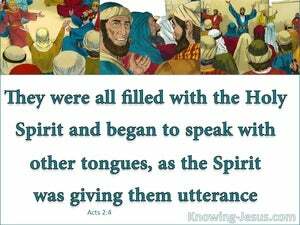 and they were all filled with the Holy Spirit, and began to speak with tongues as the Spirit gave them utterance. 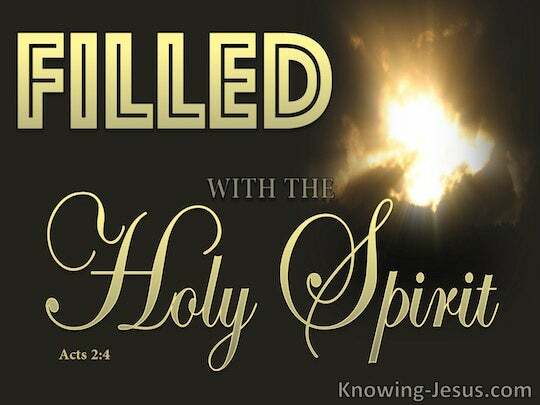 And they were all filled with Holy Spirit, and began to be speaking with other kinds of tongues just as the Spirit was giving unto them to be sounding forth. And they were all filled with the Holy Spirit, and began to speak in other languages, as the Spirit gave them utterance. and they were all filled with the Holy Spirit, and began to speak in foreign languages as the Spirit granted them to utter divine things. And they were all filled with the Holy Spirit, and began to speak with other tongues, even as the Spirit was giving them to declare. Power » Of testimony » Inspired by the "spirit"
religious Testimony » Withheld special marks of true » Inspired by the "spirit"
3 And there appeared to them tongues as of fire distributing themselves, and they rested on each one of them. 4 And they were all filled with the Holy Spirit and began to speak with other tongues, as the Spirit was giving them utterance. 5 Now there were Jews living in Jerusalem, devout men from every nation under heaven. "The Spirit of the LORD spoke by me, And His word was on my tongue. "Go to the exiles, to the sons of your people, and speak to them and tell them, whether they listen or not, 'Thus says the Lord GOD.'"